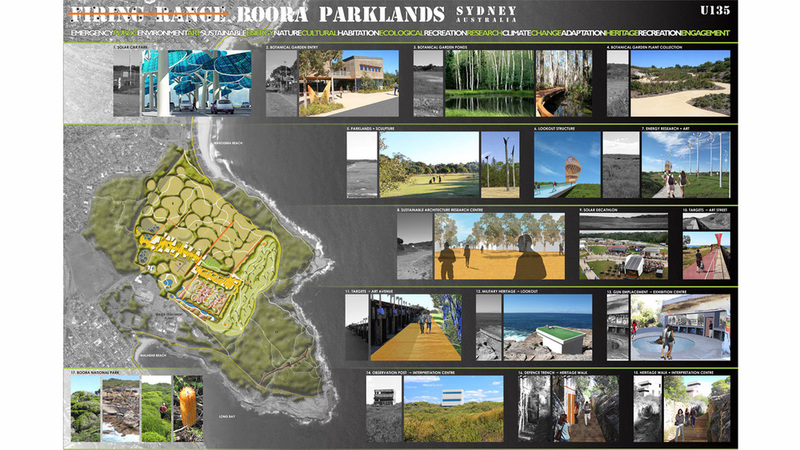 We prepared a master plan concept for Malabar Headland for the international design competition [Un]restricted Access, which allowed entrants to select any former military site around the world. Located on the Sydney coast the Malabar Headland site was occupied by Defence from 1910 to 1986. The site was used as the ANZAC Rifle Range rifle range and contains major coastal defence installations that were constructed during World War ll. The Australian Heritage Commission lists 43 important World War ll defence sites including “forts, unique gun positions, underground defence facilities, and a sunken munitions railway’. 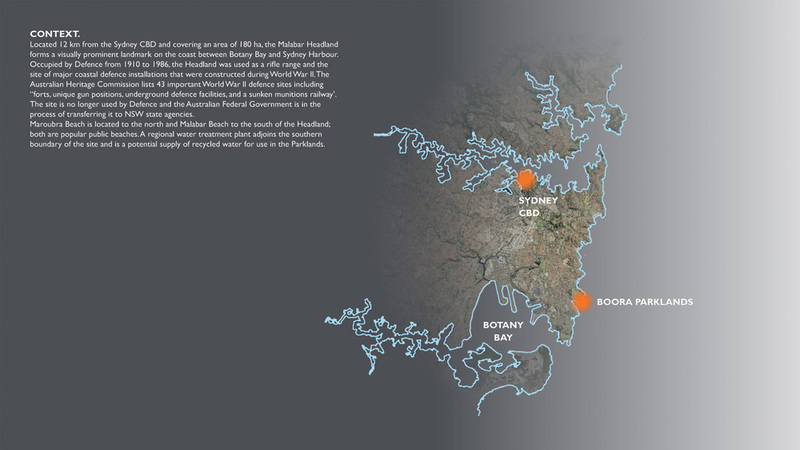 Our vision is to transform the Malabar Headland into the Boora Parklands as a ‘Centre for the Art and Science of Sustainability’. The sounds of gun fire will be replaced with the voices of children playing and visitors enjoying a wide range of recreation and cultural activities; set in the context of a site with rare ecological values and unrestricted access for everyone. Located 12 km from the Sydney CBD and covering an area of 180 ha, the Malabar Headland forms a visually prominent landmark on the coast between Botany Bay and Sydney Harbour. Bounded by spectacular sandstone cliffs the Headland provides panoramic coastal and ocean views combined with the sound of crashing waves and wind blowing through the natural coastal heath vegetation. Aboriginal use of the site is evidenced by rock engravings, grinding grooves and middens. Banksia Scrub that covers 15 ha has been dedicated as part of the Boora National Park. A further 54 ha was added to the National Park after completion of site remediation works. The balance of 108 ha, which is occupied by the rifle range, is expected to be made available as public parkland. the creative arts with the science of sustainable energy, climate change adaptation, water management and recycling will create new models of sustainable infrastructure. The concept incorporates a set of complex but related uses and facilities in a series of Precincts. The Boora Parklands would be managed by a Trust that provides the flexibility to incorporate research facilities and the capacity to generate revenue to maintain the Parklands.